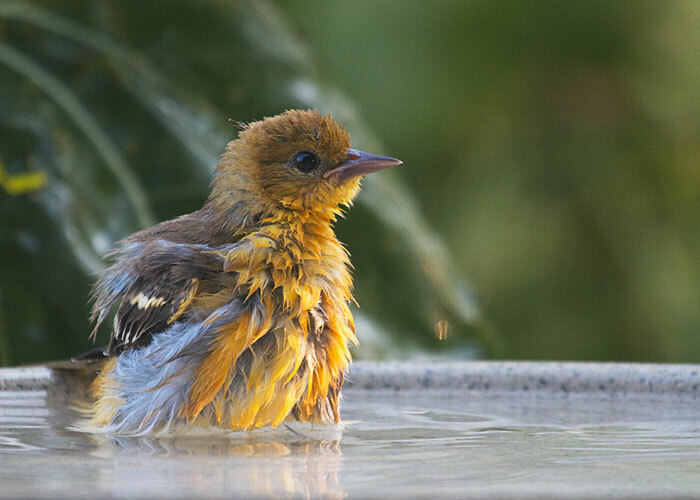 A female Baltimore oriole beats the heat with a soak in the birdbath. As the feathers clump and separate, you can see that the gold on her breast feathers is applied only at the tips, while the inner region of the feathers is gray. Gold paint is expensive. Nature doesn't waste it where it won't be admired. All the birds love a birdbath, including Baltimore orioles like the pair below and the female at left. There's also a special version, called the Kozy Resort, that includes an assembly that lets the bath fill itself automatically. Great if you have to be gone for a few days in summer.